BOSTON—The latest release of PTC’s Creo® 3D computer-aided design (CAD) platform is said to enable engineers to harness innovative design and manufacturing capabilities in one environment. Creo 6.0 introduces new capabilities in real-time simulation and extends the capabilities of augmented reality (AR) and design for additive manufacturing, along with numerous key productivity enhancements, PTC said in a press release. In the fast-changing world of product design, numerous engineering and manufacturing companies rely on Creo to build better products faster. Engineers can drive innovation in their design process with embedded simulation and can quickly turn ideas into smart, connected products with IoT-driven design. They can do this while collaborating in real-time with stakeholders around the world using integrated AR experiences, the company said. The recently announced Creo Simulation Live offering gives real-time feedback on design decisions as they are made, allowing for simulation-driven design. Creo Simulation Live is described as a fast, easy-to-use tool that’s fully integrated into the Creo modeling environment and gives results in seconds as it runs in the background. Designers can now iterate faster, discover problems earlier, and streamline their workflow. They can also cut costs, generate more options, and get better products to market faster, the company said. Augmented reality is improving the way engineers design and collaborate. The cloud-based technology offers an efficient way for engineers to share design information and collaborate securely with colleagues, suppliers, customers, and manufacturing partners. With Creo AR Design Share integrated into every seat of Creo, designers and manufacturers can iterate faster, make fewer prototypes, and engage in more meaningful design reviews. Creo 6.0 includes new capabilities to make AR even more valuable with model and permissions management for up to 10 experiences and the ability to view models at full scale using smartphones, tablets, and HoloLens. AR experiences can now be easily accessed and launched using links, ThingMarks™, and QR codes. 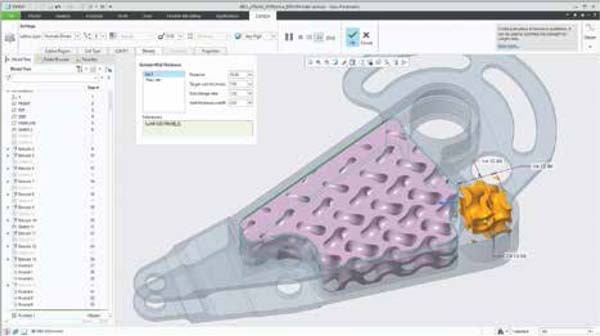 PTC said that Creo delivers the tools and connections needed to drive additive manufacturing, enabling a broad array of manufacturing processes to be supported based on demand. Users can design, optimize, validate, and print check without leaving Creo, enabling them to reduce overall process time, tedium, and errors. Creo 6.0 is said to deliver greater flexibility for designers by enabling them to build stochastic foam or conformal lattices, formula driven lattices, such as Gyroids, and define custom lattices using Creo geometry. Users now have the ability to analyze and optimize build orientation, enabling them to reduce print time, minimize support structures, or maximize tray utilization. Creo 6.0 also introduces expanded support for 3MF. Creo 6.0 is said to provide increased usability, including an improved UI for a more efficient user experience with new mini-toolbars for creating and modifying features, modernized feature dashboards, and enhancements to the model tree. Other enhancements include improvements to advanced framework and intelligent fastener extensions, model-based definition, cabling, and core modeling. More information about the features available in the new Creo 6.0 release is available at www.ptc.com/en/products/cad/creo/whats-new. PTC and Creo are trademarks or registered trademarks of PTC Inc. and its subsidiaries in the United States and other countries.